One of the first recipients said" What a masterpiece!! You do not have to apologise for the price. I always say that I remember how much I paid for a bad meal, even if it is cheap. I never remember the cost of a good meal, just the occasion. I think this book is a feast!! " A well know writer of corkscrew books said "FANTASTIC! I am really impressed by the content, the layout, and the color scheme. The book is a must for every serious corkscrew collector." Another long time collector wrote "It is OUTSTANDING. 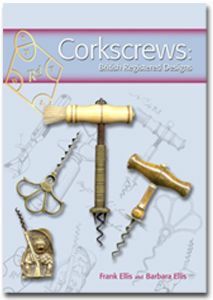 The research, scholarly effort and quality of production has produced a bible for all corkscrew collectors." At the 2007 Canadian Corkscrew Collectors Club meeting in Copenhagen, the book was greeted enthusiastically and 40 books were sold over the 3 days. Everyone praised the high quality of the content, design and printing. Postage to Canada is a problem. There is a 2 kg maximum limit for the cheaper Printed Paper rates to Canada. This book must therefore go normal parcel rate which is over £33 for 4 week delivery and £42 for 5 day delivery. There is no insurance on standard Airmail. I will obtain proof of postage but will not be held responsible for packages lost or damaged by the mail services. for customers with a UK bank account, please send us a cheque - e-mail us for address details. Use the "Order" button. Include your postal address. for non-UK customers, please pay in GB pounds using PayPal. Regular users should send payment to frank.ellis@ntlworld.com or ask for a PayPal invoice. Use the "Order" button. Include your postal address. If you wish to pay by cheque, it MUST have the address of a UK bank on it and be made out in GB pounds.